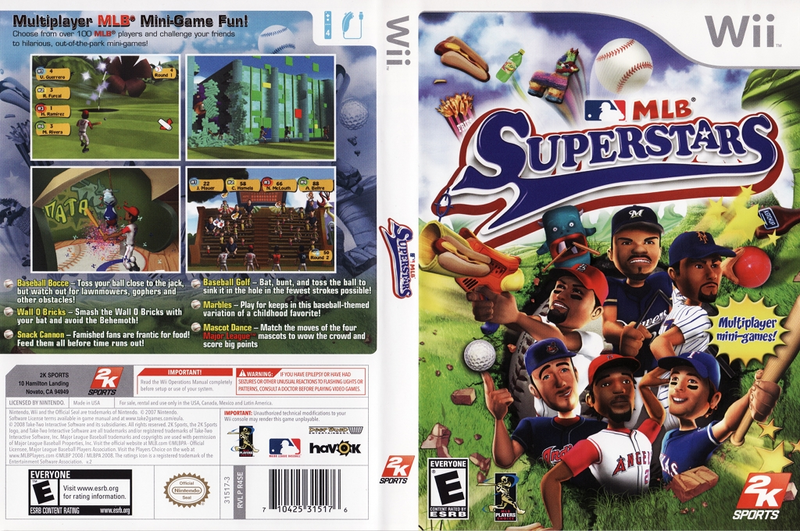 synopsis (EN) MLB Superstars takes baseball into a new realm by bringing fans’ favorite players and teams out of their natural environments and showcasing them in over half a dozen different mini games. Utilizing the Wii’s motion sensing capabilities and easy pick-up-and-play functionality, MLB Superstars puts a brand new spin on classic games with Baseball Pachinko, Baseball Bocci, and Baseball Golf. On their own or with friends, MLB Superstars offers gamers a variety of activities. Fans can play Mascot Dance and have their favorite mascot boogie to the rhythm of that funky beat, or have a good time with the Green Monster game by becoming the first to smash down their wall with a baseball bat, swinging frantically to stop the Green Monster from crashing through. Gamers aim for the high score and win numerous trophies to outfit their player in a multitude of ways. synopsis (ES) ¡Diversión multijugador con todo el estilo de la MLB! Elige entre una de las 100 estrellas profesionales de la MLB y desafía a tus amigos a competir en los más graciosos, disparatados y altamente adictivos minijuegos de MLB Superstars. ¡La diversión recién está por comenzar!